To be abundantly clear, President Trump deserves much of the blame for a setback that was unprecedented for a president in the infancy of his administration. His seemingly lack of interest, coupled with his inability to familiarize himself with intricate details of the quickly put together ACA repeal, was an instant recipe for failure (“nobody knew healthcare could be so complicated”). But a desire to rush it through was more or less was grounds for ignominious failure and, like the president’s travel ban, it came true. Now Trump is not a professional politician and Washington, as Trump found out the hard way, is controlled exclusively by professionals. He and some of his staff seemed to be dismissive, if not outright mocking of some members of Congress. Steve Bannon, who is not exactly known for his charm and grace under pressure, literally told members to vote for it (they pretty much said, “Who the hell is this guy” with one member saying the last time someone ordered him to do something, it was his father at the age of 18. He didn’t listen then either)? On the other hand, Paul Ryan is a professional politician so, his willingness to take his marching orders from Trump by moving so quickly, thereby ignoring the fact that he runs a co-equal branch of government, makes the failure more deserved. Rome wasn’t built in a day and an entire revamp of health care policy should not be put together in 18, no matter who requests it. Who best put this in perspective? Sean Hannity of all people. Hannity has been on the national stage for 20 years and I’ve never once heard him suggest outreach to other segments of the Republican Party. In fact, in a way manner that often fell between broken-record and madman, Hannity would often bemoan the very fact that centrists even exist in his party. But as the bill was going down, Hannity uttered an acknowledgement that for him, is nothing short of historic: that not everyone in the GOP is as conservative as he. He noted that the party is composed of different factions – centrists, the Tuesday Group, the Freedom Caucus, etc., and that outreach should have been made to them. He also bemoaned the speed of the bill, noting that advocates of repeal had seven years to plan, why was it rushed through? Would it have made the difference? Centrists probably couldn’t have voted for language that cuts requirements for maternity care, mental health, mammography, chemotherapy, the slashing of funding for Planned Parenthood, and other necessities of any basic health plan (not to mention the fact that it might have eliminated the insurance of up to 24 million Americans). And the Freedom Caucus might never have come around to tax credits and other government expansions. But neither side was going to do so anyway because it was a bad bill. Or perhaps, as Texas Congressman Joe Barton noted, perhaps they didn’t want to. So why would a Speaker be bringing a bill to his caucus when he knew the votes weren’t there? Because Trump told him to, I get that. But where in the Constitution does it say that a president can order a Speaker to bring up the bill? Has he heard of separation of powers? By being the President’s yes man, Ryan was asking members to “walk the plank,” and vote for something immensely unpopular when it was a near certainty the Senate wouldn’t even follow suit. 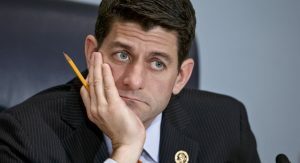 The fact that Ryan pulled the bill at literally the last second notwithstanding, were I a member of the House Republican caucus, I’d really have to ask myself if I want this man to continue leading it. Incidentally, if one thing shows, it’s that ground politics work. Showing up to town meetings – and relentlessly calling Representatives out when they wouldn’t hold it, put pressure on them that without it would have not only led to passage, but enacted a bill with many negative ramifications for the very people the ACA was designed to help. The Nunes matter is also emblematic of the Banana Republic that is the Republican leadership of the House of Representatives. 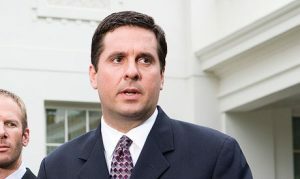 The saga began of caourse when Nunes traveled to the White House to brief Trump on “incidentally collected” communications that showed Trump may have been wiretapped by U.S. agencies. Of course, the president’s wiretap claim had been dismissed by nearly every credible agency including the CIA, FBI and Justice Department and Trump seized on Nunes’s findings as “vindication.” But Nunes’s evidence was so flimsy that it led me to hearken back to the 2004 campaign when no one could recall George W.Bush serving in National Guard. After about 4 days, an old man from Alabama came forward. A day after the revelations came out, Nunes apologized, saying he gave Trump “incidentals” at Ryan’s urging. But before long, he was doubling-down, telling Hannity he “had a duty and obligation” to tell the president before again saying maybe it wasn’t accurate. Finally, Meanwhile, Nunes never shared the intel with the ranking Democrat on the committee, his fellow Californian Adam Schiff. What Nunes was doing wasn’t just a flip-flop, it was a cartwheel, somersault and finally, a nose-dive and belly-flop. In turn, it was Schiff doing handstands around Nunes in term of gravitas, seizing the airwaves and the upper-hand by critiquing Nunes’ leadership. Four days after presenting Trump the “incidental” intel (which he examined in his office after getting a tip in an Uber without his staff’s knowledge), Nunes cancelled a key hearing. Meanwhile, Nunes still hasn’t presented the intel to Schiff. That’s no way to run one of the most important committees in the House. One thing is certain. Republicans run Washington but certainly don’t rule it. House Republicans in particular are governing so haphazardly and with blindfolds which is not only going to hamper their credibility, but at the end of the day, progress for the American people. Int may be banal, it may sound trite but Republicans agree that neither Nancy Pelosi or John Boehner would run the House in a manner like this.